We study the ground state entanglement entropy in a spin-1/2 dimer with Dzyaloshinsky-Moriya (DM) and Heisenberg interactions in a Zeeman field. For a fixed magnitude of the DM vector, the ground state entanglement entropy increases from the ferromagnetic to the anti-ferromagnetic limits of the Heisenberg interaction. In the case of anti-ferromagnetic interactions with strong Zeeman splitting there exists a non-zero value of the DM magnitude that minimizes ground state entanglement. A region of the ground state phase diagram is also described where a critical DM magnitude separates separable and maximally entangled ground states. R. dela Rosa and F. N. Paraan. 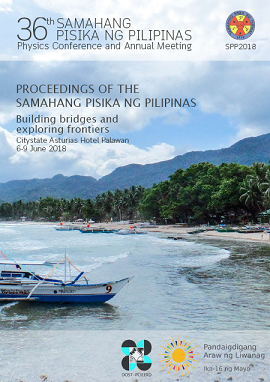 Ground state entanglement entropy in a coupled spin-1/2 dimer with Dzyaloshinsky-Moriya interaction, Proceedings of the Samahang Pisika ng Pilipinas 36, SPP-2018-PB-52 (2018). URL: https://paperview.spp-online.org/proceedings/article/view/SPP-2018-PB-52.